Having tried so many tailors and shoemakers, I am often asked to compare them. With bespoke shoes, the most common question is which maker achieved the best fit. However, the fit often doesn’t vary that much, and most importantly (perhaps depressingly) often takes two pairs to perfect. The style and construction, on the other hand, can vary more than people think – particularly between makers of different cultures or traditions. In the example I am going to use here, between the Northampton-influenced shoe of Gaziano & Girling and the more city shoe produced by Cleverley. I had these two (pairs of) shoes made over the past three years. They are obviously different in their style and last shape – the slip-on is a relatively conservative square-toe for G&G, while the Oxford is Cleverley’s new Anthony Cleverley design. The most significant differences are in the thickness and layers of leather used by each maker, however – which becomes immediately obvious when you put them on. The front of the Cleverley shoes are unlined. Both makers use a half sock in the bottom of the shoe, and a lining in the sides, but the G&G lining extends under the front of the shoe, where Cleverley’s does not. Cleverley uses a thinner leather, generally, particularly on Oxfords such as these. (Although the two shoes here are obviously not direct comparisons, the same approach applies across both ranges.) That means the shoe feels lighter and instantly more comfortable, but it also provides less support, making your foot feel tired towards the end of the day. The Gaziano & Girling shoe is more similar to the Northampton makers – Edward Green, John Lobb etc – that readers will be familiar with. This is not surprising, for while Tony G used to work at Cleverley, he also launched the bespoke offering at Edward Green and the shoes themselves are all made now in Kettering, just outside Northampton. Other giveaways of a Northampton shoe are the aesthetic effects such as burnishing, which requires a rotating-brush machine that Cleverley is unlikely to ever install at the Royal Arcade. Which is better? Neither, in my opinion. They are simply different styles, each with attendant benefits. 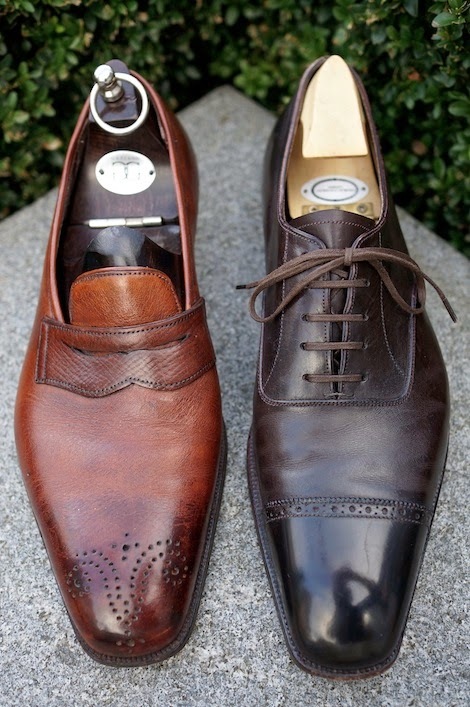 But if you’re thinking of having a bespoke pair of shoes made, it’s worth being aware of the difference. You can follow the discussion on The divergent styles of Cleverley and Gaziano & Girling by entering your email address in the box below. You will then receive an email every time a new comment is added. These will also contain a link to a page where you can stop the alerts, and remove all of your related data from the site. Simon, why do bespoke shoe makers not put a full length leather sock on the bottom of a shoe, instead opting for a half sock like poor value RTW shoes? The blasted thing furls up at halfway up the shoe and irritates the hell out of the bottom of your foot. Why try and save a few pounds like this on a shoe which costs over £1500? Cheap. Makes you wonder what other corners these sorts of makers are taking. It’s not cutting corners. As with layers of leather elsewhere, it has dis- and advantages. I’ve never had any curl up. Dear Simon, I am a long time fan of Silvano Lattanzi shoes. I think it is interesting Italian culture and enormous comfort and longevity. Thanks. I haven’t written about them but do know them fairly well, having visited them once and caught up at Pitti a couple of times. Would you say the narrowness of the waist and how closely the shoe follows the arch of one’s foot is anything to do with an individual company’s house style or is that simply a matter of fit? I ask because I’ve had one pair of shoes made at Cleverley and, although I’m mostly happy with them, one thing that surprised me after seeing so many pictures of G&G bespoke shoes, especially the sole shots, was that my Cleverley pair are fairly fat around the waist. If I had another pair made I would certainly ask about getting them tighter into my arches. As you say in the article, I think it does take at least two attempts to get the fit nailed down. Unfortunately with waiting times of 10 months or a year it’s not a pastime for the impatient. P.S. I’m the guy who complimented you on your blog in Graham Browne last Thursday while you were waiting for your Italian tailor. I hope he found the place eventually. It was nice to meet you Julian. Interesting to hear your Cleverley experience too. I found the waists to be similar on mine, but that may be to do with the shape of my foot. Ask Cleverley next time about whether that is something that can be refined. What about the Anthony Cleverly RTW? I was under the impression that those are made by Cleverly in house in much the same way as they do bespoke. There are quite a few freelancers around Northampton who work in the various factories part time. Much of the work, particularly closing an cutting, can also be done at home. A very informative post indeed. One question re Cleverly: if the front of their shoes are unlined, how do they manage arch and toe stiffeners? There are still two layers of leather there – but in the back there are three. Indeed he has. In fact the shop is about 20 yards from my office! the The of the cleverley shoe is lined. The vamp has a softer lining than the back tho.. The GG shoe has a wholecut lining that extends all they way to the toe. a GG oxford would be lined in a simular way to the cleverley one im sure. I have a question for you regarding shoes: Assuming a relatively sleek last, calfskin in either brown or black, and no “brogueing” on the toe, can monk-strap shoes (single or double straps) be worn to the office with a business suit (not an informal suit, but a pinstripe or worsted)? Along the same lines, what about a closed-lace (i.e., non-derby) wingtip shoe? Thank you for your consideration, and highly informative blog. first of all, thank you very much for such a great blog/Webpage. I regularly visit your page and everytime I am astonished about the things you are writing. Currently I am in London and looking for a bespoke shoe maker (more specific Chelsea and Chukka boots with a more “modern”/”stylish”/”younger” twist). In preperation I read different Blogs, but most of the time they normally cover “just” shoes and not boots. Therefore I turn to you to get your recommendation where to go for Chelsea or Chukka boots (for “normal” shoes I rather go to Italy – based on the style etc.). I know – even if you give me a recomemndation – that I have to visit the different Shops to get an idea of styles and techniques the manufacturers use. I think any of the good London bespoke shoemakers would be able to do you a nice Chelsea or Chukka boot. I’ve seen some nice ones from G&G, for example (Chelseas), and I’m considering a pair in the Russian reindeer from Cleverley. I happened to be walking past George Cleverley’s shop yesterday, and saw in the window a nice pair of “semi bespoke” brogues in their winter sale, reduced from £800 to £450. I assume their ready to wear range is not made in store; do you happen to know who makes it for them? I assume they must be based in Northampton! Ted, I think the shoes you mention may be the same ones that I bought today: the Peter 2 model in dark brown. (All others in the window were cheaper models I think). Simon, the shoes seem to be of excellent quality to me, and better than my crockett shoes: do you happen to know if they are similar in quality to edward green/Gaziano and Girling shoes? Dear Simon, would the Cleverley perhaps be a less durable shoe than the G&G? Would one outlast the other by a few years (all things being equal)? Hello, I’m looking to make a pair of bespoke shoes at John Lobb St. James, but when I found out that their shoe trees may cost 787 pounds, it seems outrageous to me. Do you think this price is worthy? Can I just buy a nice but cheap pair of three-piece shoe trees from Leffot instead? Also, Do you find expensive bespoke shoe trees irreplaceable in general? Thank you! It depends on the shape of your feet, to a certain extent. 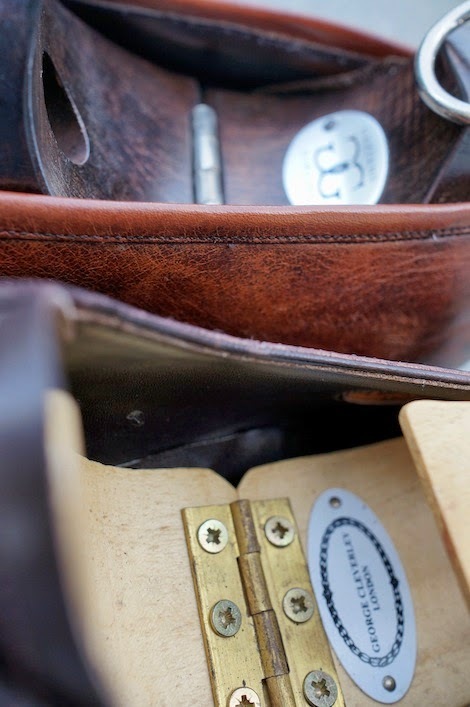 Many regular shoe trees won’t fit bespoke shoes, because the shape is so particular. But your feet might be fine. Thank you for your quick reply. By the way, under the city category of your trunk show column, can you combine “New York City” and “New York” together? It would be much more convenient for us NYC residents to check. Having had my first bespoke and very expensive pair from John Lobb St James I cannot recommend them. They simply do not do fittings to adjust nor do enough measurements. The shoes were made, did not break in and killed my feet and JL eventually admitted they were made too tight. So they remade them (when they saw my poor red toes) and now they are slightly too big! A former college friend had two pairs made there and the same disappointed experience. The waist on the shoes is lumpy and the overall appearance of the shoes are old-fashioned and certainly not flattering. No trial shoe was even offered to either of us. You would expect intermediate fittings and adjustments on a bespoke suit so why not on shoes? So I tried G & G RTW – great value and fit, combined with elegance. Now I’m having my first bespoke pair made there and have been pleasantly surprised how much more measuring and care is being taken towards getting them right – plus a trial shoe to wear for a few weeks so the wear can be followed and the last can accordingly be adjusted. And the G & G price includes the shoe trees (I won’t be chucking another £750 in JL’s direction and will make do with a standard tree). I hope John Lobb realise that resting on the laurels of past aristocratic trade is no guarantee of future patronage, Royal or otherwise.